Update: A-1 Pizza has re-opened. Click here for the full story. 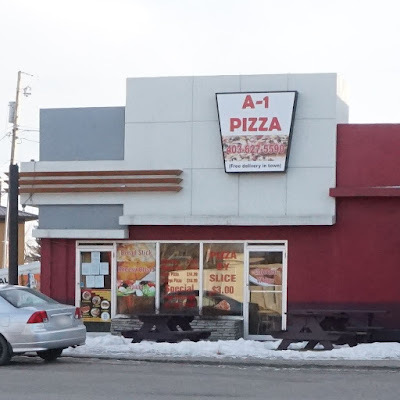 Chris Davis - A-1 Pizza located at 970 Main Street in Pincher Creek received a closure order today after failing a public health inspection conducted by a local Alberta Health Services Executive Officer. The closure order noted a number of conditions "which are or may become injurious or dangerous to the public health or which might hinder in any manner the prevention or suppression of disease," and it also states that the "facility is maintained in a gross unsanitary condition". A number of conditions must be met before the restaurant can be opened again. Facility is maintained in a grossly unsanitary condition, including but not limited to a significant buildup of grease noted on the ceiling above the pizza oven. Broken and water damaged ceiling tiles noted in the food handling areas. A chest freezer was found in disrepair and filled with garbage. Dry storage area shelving is very dirty and in a state of disrepair. Shelving in walk-in cooler is very dirty and in a state of disrepair. Pizza oven does not have sufficient ventilation to adequately remove grease laden vapor. Several light covers in food preparation areas are broken or falling off. Pizza preparation cooler internal temperature was between 12.4oC - 14.6oC. Food was held in pizza preparation cooler for extended period of time at improper temperatures, making the food unfit for human consumption. Several floor tiles and wall tiles throughout the facility were broken or missing. Door handle on walk-in cooler is missing. Insect screen on door is damaged. There were no staff on shift with a certified food sanitation training certificate. Written cleaning and sanitation program is not sufficient. A very large amount of garbage and general clutter has accumulated near the back door which can be harbouring pests. Still the best pizza in town!! Still the best pizza in town!